Automotive industry is at the forefront of this trend looking for effective alternatives to cut down on weight without sacrificing durability, which is under constant pressure to adhere to increasingly strict fuel economy standards. With CAFE standards becoming increasingly stringent, automobile manufacturers have been forced to continually find new ways to increase fuel economy. It has been the primary strategy that manufactures lighter vehicles to improve gas mileage, and the use of aluminum parts that replace steel parts has been the most popular method to reduce vehicle weight. Over time, aluminum has been progressively incorporated into automotive doors, trunks, hoods, and engines. Today, aluminum makes up a much more significant percentage of the vehicle. According to Ducker Worldwide, aluminum is now the leading material used in the manufacturing of engines and wheels in automobiles. Audi has been manufacturing an all-aluminum structure for its A8 model for nearly 20 years, and other companies in the industry are beginning to follow suit. Currently, Ford is developing an all-aluminum structure for its F-150 pickup, the best-selling vehicle in North America. Heavy usage of aluminum in automobiles first began with Audi’s 1994 A8 model.3 Since then, standard consumer automobile manufacturers have been amplifying the aluminum used in their vehicles and are beginning to transition to primarily aluminum-based vehicle bodies. Ford has become one of the pioneers in aluminum usage for the automobile body, aiming to release an aluminum-body F-150 in 2015. Changing the body from steel to aluminum is expected to cut the weight of the car by about 700 pounds, or 15 percent of current vehicle weight, which would increase fuel economy by as much as 25 percent. The decreased weight in the vehicle also improves towing, hauling, acceleration, and stopping abilities making it an all-around more efficient vehicle than its steel-based counterpart. Because the F-150 is the undisputed leader in American pickup truck sales as well as the best-selling automobile in North America, other large automobile manufacturing companies are likely to follow suit and incorporate greater amounts of aluminum parts into the body of their vehicles. A shift from steel to aluminum in the body of vehicles by more than just Ford could help the demand for aluminum increase by as much as 40 percent in the upcoming years. 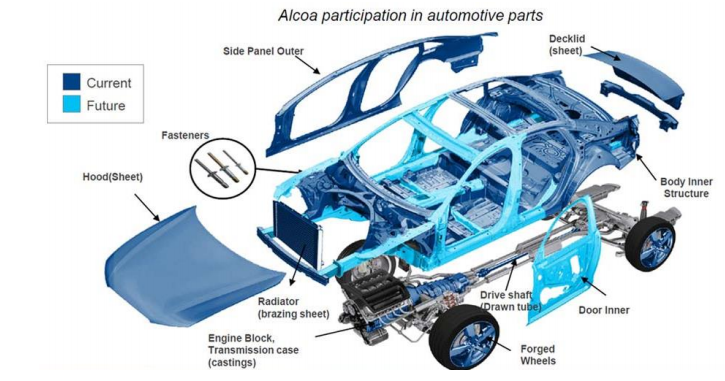 Below is an image from Alcoa that represents the current aluminum used in automobiles and what is expected to be aluminum-based by 2025. 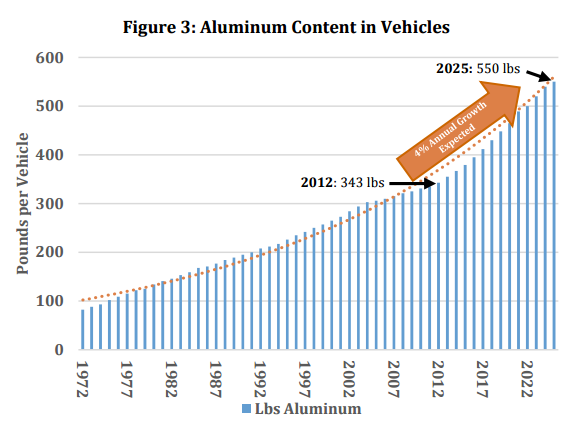 The trend of using aluminum to reduce a vehicle’s weight is expected to continue throughout the industry. Aluminum is lighter, more energy efficient to process, and has comparable pound-for-pound to steel. Steel’s heavy nature has become a burden on fuel efficiency. While aluminum has been identified as the most effective material for light weighting, its use often involves a tradeoff of strength for weight when compared to steel. Structural durability of aluminum components is often considered their biggest drawback; however, even that is less of a concern as aluminum can be made nearly as structurally strong as steel through processes such as heat-treating. A majority of the aluminum used in the body of vehicles is 6000-series alloy aluminum, which is heat-treated to the end user’s desired strength. The strength of heat treated aluminum alloy is capable of exceeding that of some grades of steel while still retaining its light weight and malleability. Power tools that cannot be used with steel can cut through or hammer down aluminum leading to both cost and speed advantages in the production cycle. Aluminum can also be designed to absorb as much as two times the crash energy compared to mild steel. Aluminum, when replacing steel in today’s vehicles, could save approximately 44 million tons of CO2 emissions per year, and nearly 90 percent of the aluminum used in vehicles is recycled at the end of its lifecycle. The automotive industry is expected to continue to grow in the U.S., and aluminum is expected to play an increasingly important role in this attractive market. Results from an Alcoa study have shown that for every ten percent reduction in vehicle weight, fuel economy can improve between five and seven percent.7 Additionally, as many as 83 percent of car buyers are willing to spend more for a fuel efficient vehicle,8 further motivating automotive manufacturers to focus more efforts on light weighting. Aluminum use in the automotive industry has been increasing at a CAGR of approximately five percent over the past few years and is expected to grow more rapidly over the next decade as environmental trends and government regulations on fuel efficiency continue to tighten. During the process of die casting, molten metal is injected into two parts of a shape (the die), which are stuck together. The metal is injected under high pressure. After it has cooled, the two parts of the die come loose and the part is removed. Because the same die is used again and again, each part comes out looking exactly the same. The process of designing the die is the only technically difficult part of the operation. A lot of factors have to be considered to make sure that no air gets trapped inside the molten metal when it is injected and calculations on the draft angle have to be made to make it possible for the part to be ejected easily. 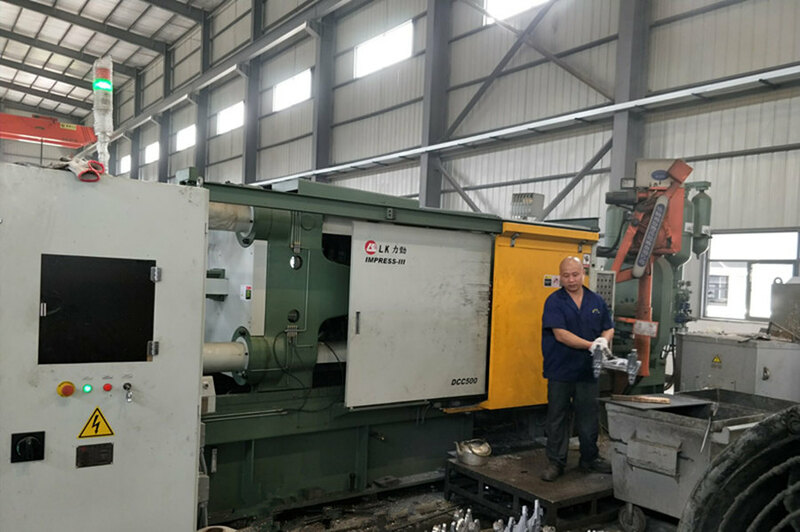 This process is used in almost every industry in the world and it is unlikely that you are not surrounded by items right now that have been created through a die casting process. Die casting is an efficient, economical process offering a broader range of shapes and components for automotive industry as well as other applications than any other manufacturing technique. Parts have long service life and may be designed to complement the visual appeal of the surrounding part. Automotive parts designers can gain a number of advantages and benefits by specifying aluminum die casting parts. High-speed production – Die casting is able to produce automotive parts with complex shapes in closer tolerances than many other mass production processes. Little or no machining is required and thousands of identical automotive die castings can be produced before repairing the molds. Dimensional accuracy and stability – Die casting produces automotive parts that are durable and dimensionally stable, while maintaining close tolerances. They are also heat resistant. Strength and weight – Thin wall castings of die cast automotive parts are stronger and lighter than those possible with other casting methods. Plus, because die castings do not consist of separate parts welded or fastened together, the strength of automotive components after die casting is that of the alloy rather than the joining process. Multiple finishing techniques – Die cast automotive parts can be produced with smooth or textured surfaces, and they are easily plated or finished with a minimum of surface preparation. 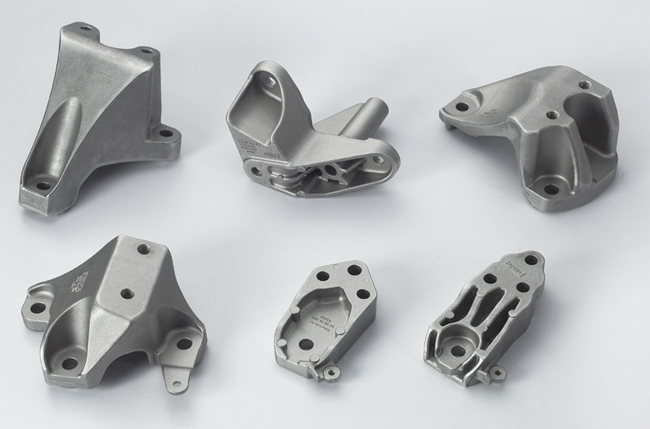 CFS foundry is the leading company for producing aluminum die castings for automotive industry. We have equipment designed to produce from 1 ounce to 50 pounds depending on your specific needs. Our design process assures parts meet exacting specifications and our streamlined manufacturing systems allow us to offer aggressive casting delivery times. Our engineers have the expertise and innovative creativity that can meet your most demanding requirements efficiently, cost effectively and within your desired schedule. Our die casting technique is hugely popular in making automotive parts for automotive industry. Cars have many aluminum parts that have been created through die casting methods. In fact, It is not impossible to list out all the aluminum die castings for automotive industry. However, let’s take a look at some of the most commonly used automotive parts that have been created in Die Casting China. Almost every part of the engine is created through die casting. For instance, the cylinder heads on the engine are made through the process of die casting. Also, all the parts on the gas engine are made almost completely out of die casts. Generally, the alloy that is used in these processes is aluminum. The stator is generally also made through aluminum die casting. Stators have many variations in size. This is why using die casting is such a good method, because it allows for different sized mechanical parts to be created with the highest degree of accuracy every time. Brackets are also created through the process of die casting. Brackets are used in the electrical part of the motors. Also, stepper motors also use die casted brackets and these are generally created as per the specifications of the customers. Electronic covers are created in many parts of cars. You will see them on the gearbox for instance, but also the shades pole, the motor and on the stepping motor. These are but a few examples of where electronic covers are used through die casting processes. There are many other parts within the automotive industry that are made through die casting methods. For instance, the heat sink and the auto fork are made through die casting. In fact, there are very few parts of a car that aren’t created through die casting.